3D Modeling and interior rendering of a custom designed 2,000 square foot home in the mountains outside of Golden, Colorado. Modern computer technology has revolutionized building design! We are no longer limited to two-dimensional representations of our imaginations and unconnected, non-intelligent elements within our design programs when trying to visualize a finished space. Using ArchiCAD 18 integrated with CineRender, Maxon's world-class CINEMA 4D rendering engine, King Engineering can create an entirely accurate model of what your building's interior and exterior will look like when construction is finished, including time and date specific sun shading and daylighting. Modeling can be done either in low detail to give you a basic visualization of the project, or with highly detailed finishes, fixtures, and furnishings displayed with photo quality or artistic renderings, or whatever your budget can accommodate. With the newest software tools, we can create an astonishingly realistic 3D environment that can be manipulated or viewed from any angle, with partial cutaways or as a whole. The 3D views are derived from the same information as the 2D construction drawings, resulting in views that are perfectly to scale, giving you a preview of how a space will look and function. And since everything is linked, or "intelligent", a change made in one view will automatically track through the entire project making exploring different options as quick as the push of a button! 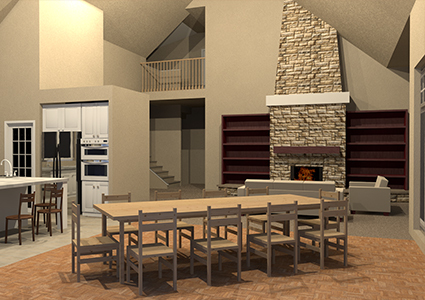 Whether you are building new construction, planning a remodel or renovation, or just working on interior design, our 3D models will make sure that you know what you are getting before you get it. This technology also improves efficiency to the design process, because it eliminates regrets and second thoughts when you see the finished work...before it is built! Conflict resolution is another huge advantage with our 3D models because interferences that may have been difficult to recognize on 2D drawings and then show up only during construction, become crystal clear during the planning stage before anything is ever built. Not only do our clients benefit from this technology in planning their buildings, but also the contractor benefits enormously during bidding and construction when able to see the 3-dimentional relationships between elements that he/she is given the task to construct. Our unique ability to provide professional engineering, architectural drafting, and 3D modeling in-house, and often by the same designer, rather than outsourcing it to specialized sub-consultants, eliminates coordination oversights, and can save both time and money throughout the entire process.